The Fellowship was fortunate enough to obtain a copy of DEPT. H #1 from Dark Horse Comics. 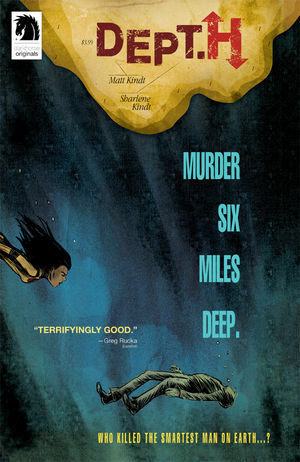 Matt Kindt writes and draws, and Sharlene Kindt colors. The government has asked Mia to do the most difficult thing possible. They’ve asked her to go to their undersea research facility, Dept. H, to determine who murdered the head of the facility. She must go into a tin can at the bottom of the ocean, the last hope of humanity, to determine which of the seven people living and working there killed her father. She knows all of them well, and they all know why she’s there. So “swimming with the sharks” might be cliché, but it really fits Mia’s story. And anyone who’s read Mind Mgmt, for starters, knows how deeply layered Kindt’s writing can be. This book is well on its way, too, and that’s just in the first issue. He’s also got a knack for expressiveness in his art which just adds more of those layers. I can’t imagine a story better suited to the term “under pressure,” but even if there’s no intentional metaphor here, it’s still a great mystery/adventure in the making. Pick this one up. DEPT. H #1 is available now at your FLCS or at darkhorse.com.